The Merano natural oak barstool can be the designer focal point of your on-trend kitchen. Italian furniture designer Alex Gufler has created this modern natural oak barstool with a firm handle on refined designer style mixed with natural, organic design. With a perfect balancing of forms, this beautifully simple oak barstool adds a chic and stylish vibe to your kitchen counter seating or breakfast bar. 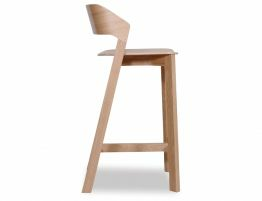 A harmonic marriage of angles and curves is paired with European made furniture quality to offer modern furniture lovers one of the most strikingly simple barstools ever created. Outfit your kitchen counter or breakfast bar with designer oak barstools from TON and Alex Gufler. The Merano natural oak Danish barstool elevates the oak wood’s natural grain and the sculptural seat provides eye catching details and comfort. Not only is this kitchen barstool attractive, it is made to withstand the heavy use most kitchen barstools see.